One of the long-term adjunct projects of the Dictionary is to look at how various names are spelled in the earliest vernacular translations of the Bible, because these translations had a significant influence on how the names were spelled when they were used in common currency. Because there are so many Biblical names and so many vernacular translations produced before 1600, added the citations to the relevant entries is an on-going process; we can generally add the Middle English forms from the Wycliffite translation of 1395 right at the start because there is a handy online searchable version of it available. For other Biblical names, we are slowly working through the alphabet adding for (cf., e.g., Aaron, which has forms from the Wycliffite Bible, the Geneva Bible of 1560, and in the next edition will have citations from the Sagrados Escrituras of 1569). The York Gospels were brought to York in around 1020 by Archbishop Wulfstan and the 1,000 year old text is still used in services today. The Anglo-Saxon book is one of the most valuable in York Minster’s collection and is one of the few surviving items from the Saxon Minster, the location for which is unknown today. It contains four Gospels rather than the whole bible and is filled with elaborate illustrations as well as a letter from King Canute dated around 1019. It’s believed its original pages were written in Canterbury in around 990AD, with additional pages added to the manuscript by the Dean and Chapter after they arrived in York. The Gospels are currently on display in the cathedral’s Revealing York Minster in the Undercroft attraction. 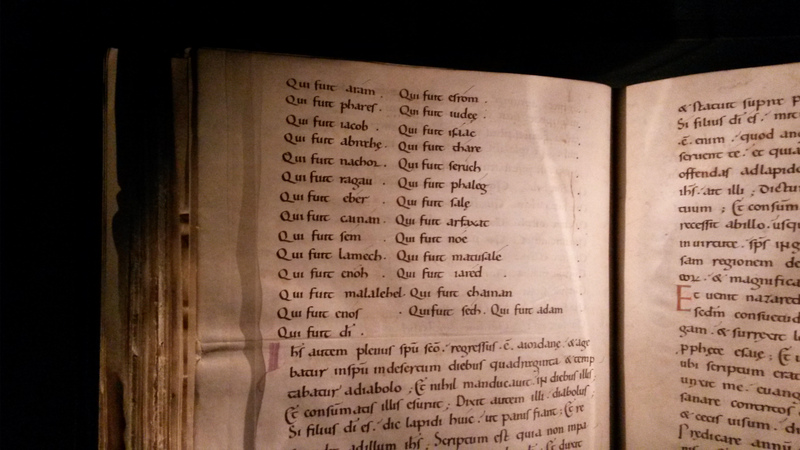 The book is stored behind glass but visitors can turn virtual pages of the book to take a closer look at some of the illuminated pages using touch screen displays adjacent to the case. Often when a manuscript Bible is on display, a page with a fancy illuminated initial, or a whole-page picture, are chosen; these are the eye-catching ones that display the true beauty and skill of medieval artwork. But the York Gospel has a rather plain and simple spread on display, something that might seem boring or ordinary to the average viewer. The page that’s on display contains part of the genealogy of Jesus, and thus it gives us first-hand knowledge of how scribes rendered these names in Latin in the 10th C.
…who was of Aram, who was of Efrom, who was of Phares, who was of Iudea, who was of Iacob, who was of Isaac, who was of Abraha, who was of Thare, who was of Nachor, who was of Seruch, who was of Ragau, who was of Phaleg, who was of Eber, who was of Sala, who was of Cainan, who was of Arfaxat, who was of Sem, who was of Noe, who was of Lamech, who was of Matusale, who was of Enoh, who was of Iared, who was of Malalehel, who was of Chainan, who was of Enos, who was of Seth, who was of Adam, who was of God. Why is James a form of Jacob? Today’s question is another one that probably everyone who has spent any time thinking about names has thought about at one time or another — just how exactly do you get James as a variant of the name Jacob?! The only letters they share are Ja-, which from a modern point of view is a pretty tenuous connection. The answer is…it’s actually pretty straightforward! The standard Latin form of the name was Jacobus, but in Italy, southern France, and Switzerland, the -b- became -m-, e.g., Jacomus, eventually giving rise to the Italian form Giacomo and the Provencal and Catalan form Jacme. Very rarely, Jacomus became James in Old French, and when that form of the name got imported into England (early 13th C examples of James in England can be found in the records of King John), it supplanted the more common Old and Middle French forms Jaques and Jacques. This is why you tend to see James only in insular contexts; over on the continent, the Langue d’Oil forms retaining -c- dominated. Though we may be all about the medieval names at DMNES central, this is, for most of us, because we are interested in names in general, medieval or modern. So it should be no surprise that one of the highlights of the onomastic year is when the US Social Security releases their baby name data for the previous year. These lists are always a curious mix of the eminently traditional and the bizarrely modern, and there is little way to predict where a name will occur in the list on the basis of which of these two camps it most falls in. We thought we’d spend time this month looking at the names in the top 1000 and tracing back their origins. Are the new-fangled ones as new as they seem? What are some variations people could consider if they want a different twist on an old-fashioned name? Noah: Number one name Noah is part of a venerable tradition of taking names from the Bible, but as we’ve discussed before. The name was used rarely in medieval England due to the mystery plays, but only became popular at the end of the 16th C.
Liam: Liam is one of those name which is not medieval but derives from medieval origins. It is a diminutive of Uilliam, the Gaelic form of William which was in use since the Anglo-Normans invaded in the 12th century. However, the truncated form didn’t arise until after the 16th C was over. Mason: Originally an occupational byname, this derives from Old French maçon, masson ‘mason’. Jacob: This name and number seven below have, even more than Noah, a venerable history of use. Jacob can be found throughout Europe, while James is a distinctly English form of the name, even though in origin it derives from the Latinized French form Jacomus, which became Jacme in the vernacular. William: This is one of the few names of Germanic origin that not only didn’t fall out of use over the course of the 11th and 12th C, but became, if anything more popular. From William to Guillaume to Wilhelm to Guglielmo, the name adapted itself depending on the vernacular in which it was used. It also gave rise to a plethora of nicknames, including recognizably-modern ones like Will to unusual forms like Willick, Willeke, Wilquin, and Guilemon. Ethan: This Biblical name has always been more popular in the US than elsewhere, due to the fame of the Revolutionary hero Ethan Allen. We don’t yet any examples of the name, but given the trend for adopting obscure Biblical names that we’ve documented before, we would not be surprised to find some post-1550 examples in French, English, or Dutch. James: While James may be a distinctly English form of the name, it still has equal right to be called a Biblical name: This is how Jacob’s name was spelled in the Wycliffite translation of the Bible into English from 1395. Alexander: Another name which has been a classic for millenia, ever since one of the greatest military figures the world has ever seen swept onto the stage. The etymological origin of the name, deriving from Greek elements meaning ‘I defend’ and ‘mankind’, has also contributed to the popularity of the name. Medieval nicknames tend to differ from the standard modern Alex, with Sander, <Sanders, Zander, Sandry, Saßa, and Sandrin found in German, Dutch, English, French, and other contexts. Michael: Another name of Biblical origin. This name was popular throughout Europe, and, interestingly, it was so without having been the name of a pope, other major religious figure, or a king. Benjamin: Like Noah, Benjamin is an Old Testament name whose common use dates to the 16th C.